SOME THREE years ago, 'Boy', U2's debut album, was released and -- pivoting on 'the three primary colours" -- it was and still stands as one of the most refreshing and strongminded rock albums ever released. A voyage through adolescence to the threshold of manhood, 'Boy' moved from fear, remorse, elation to realisation with a crisp agile music and spinning celestial spirit in its sense of wonder and joy of discovery. 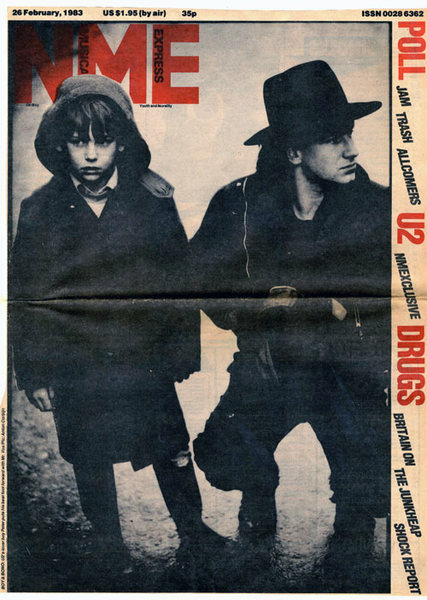 With 'Boy', U2 moved out into the wide world beyond their native Dublin, determined to maintain their strong purpose and dignity within the hoary world of rock 'n' roll but always holding belief in the power and potential of both rock music and its culture. From the spring and hope of 'Boy' through the austere autumn of 'October' we come to the violent raging winter and the backdrop for 'War'. The 11-year-old freshfaced, innocent kid from the debut album is again pictured on the cover but now his face has a distinct look of alarm. On the inside sleeve our four warriors wrap up against the frozen Scandinavian wastes. Although personal allegiances and commitments remain, 'War' depicts a world in conflict and disintegration. Which is hardly news to anyone. The first thing that strikes about this record is that it's constructed from the detached viewpoint of a cocooned rock band. Perhaps they really have just woken up to what's going on; perhaps they feel that only now, after seeing many of the terrors and tragedies in the world first hand, are they in a position to write about them; or perhaps it is part of a contrived strategy to illustrate the growing awareness of four young men. Whatever, it doesn't stop much of what is here from sounding like hapless, dated Clash style agit-pop. The little drummer boy artillery lambast of 'Sunday Bloody Sunday' opens; lyrically and musically it reminds me of a slightly superior Stiff Little Fingers, hardly what the world needs right now. The singing of Bono Vox is much better than Jake Burns, however; indeed his strong melodic voice is a rare quality in rock music and even when the songs and performances sink low (and they do sink very low in places), it still resounds -- clear and graceful. Where 'Boy' floated and stung 'War' is hog tied and hamfisted, where 'Boy' shone and flowed 'War' is dull and static where 'Boy' propelled lucid pellets of fire and imagination 'War' cranks out blank liberal awareness. 'War' sticks basically to the primary colours (although there are occasional embellishments from trumpet and violin). Consider then a record that attempted the same theme as 'War' -- a start of the decade, state of the earth concept -- Marvin Gaye's 'What's Going On'. It had to use a maze of strings, woodwinds and horns to generate its daunting, haunting mood. One wonders if the basic rock format is equipped to deal with such a task. I could never underestimate U2's concern or their sincerity but for me the uplifting passions and preoccupations that grasped the imagination on 'Boy' are buried too deeply in the density and overdrive of 'War' to have any effect. For everything the LP tries to express I can pick out music from Van, Otis, Aretha; or even -- for a sound that really rises like the howling seas and erupts like a volcano -- any of Phil Spector's mini-orchestral epics is far more effective than the corrosive brutal dynamics of this rock music. In spite of itself 'War' is another example of rock music's impotence and decay.